After being recalled on December 8, making his NHL debut the next night in Edmonton and recording his first career point (an assist) in his fifth game on December 19, Brad Malone's last two weeks have been a whirlwind of emotions. 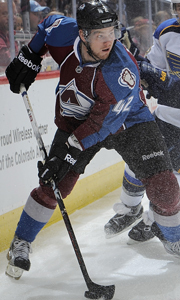 Rookie Brad Malone is riding a two-game point streak (0g/2a); his first two points of his NHL career. The rookie from Miramichi, NB, admitted it was a "dream come true" in a Q&A three days after his NHL debut, and the gritty forward has come on strong in his past three games. In fact, Malone has points in two consecutive games (both assists) and is averaging 11:12 time-on-ice over his last three games since being bumped up to the third line with Jay McClement and TJ Galiardi. "There's still a lot to learn, but playing with J-Mac (Jay McClement) and Gali (TJ Galiardi) has helped me," said Malone, in reference to his linemates of the past three games. "They're both veteran guys and they've been keeping it simple for me and being vocal out there. They're making my job easy. We've gotten some lucky bounces so it's been nice the last couple of games." Fast forward to tomorrow's contest against the Tampa Bay Lightning. It'll be more than just the rookie's seventh career game. Friday's game will mean more for the 22-year-old Malone. When Brad and his teammates step onto the ice for pregame warmups, he'll only have to look across the ice to see a member of his family. 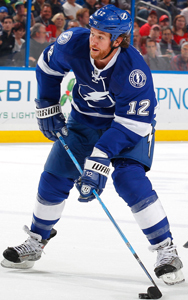 Brad's cousin, Ryan Malone, has been a member of the Lightning for the past five seasons and is an eight-year veteran of the National Hockey League. The 32-year-old also played in the 2010 Olympic Games in Vancouver, helping Team USA earn a silver medal. Ryan Malone, Brad's older cousin, is in his eighth NHL season. "When I got sent back down [to Lake Erie] in October, that was my goal - to get back up here and play Tampa," Malone said. "Playing against Ryan will be pretty special for myself as well as my family so it's going to be a pretty exciting couple of days." Brad says he keeps in touch with his older cousin on a regular basis. "He's got a busy schedule like everybody else and he has a family, but he's always sending me phone calls and texts. So I'm sure we'll go out to dinner tonight." Being 10 years younger, Brad naturally looked up to Ryan as he advanced in his hockey career. "He's probably one of the reason why I took the path that I chose with hockey," Malone said. "He was one of my idols growing up. Everything he did I tried to model myself after. To play in a game against him, tomorrow, is pretty humbling and it's pretty special." But the 22-year-old realizes that serious bragging rights are on the line when the two cousins step onto the ice tomorrow night. "I'll definitely have a personal advantage at the family dinner [if the Avs win] so it's pretty exciting." But now the question remains: Who's picking up the tab tonight?